My hero cousin James and his lovely wife Michelle came for lunch yesterday. While it was not a beautiful sunny day we still had a cold meat and cheese menu after I managed to get the last punnet of fresh figs from Woolworths. 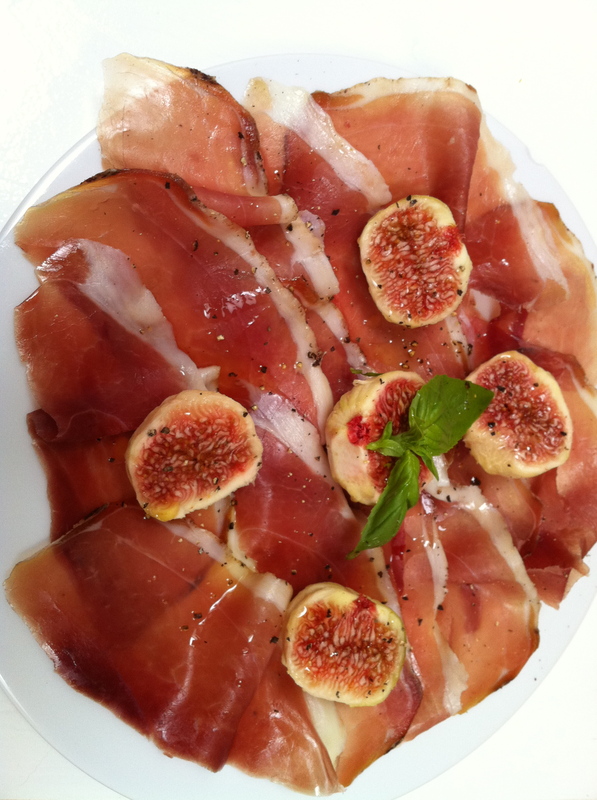 Some food combinations are just sublime and prosciutto and figs is one of them. It is so easy to prepare, just arrange the ham on a plate with the halved figs ( I like to peel mine but you can eat the skin). Drizzle with some olive oil and a grinding of black pepper and it is ready. We ate it with some delicious olive ciabatta from Knead and even James was quiet for a few minutes until the plate was empty. Sometimes we are tempted to over complicate things in life when the simple things can bring the most pleasure. Yum! So if I can’t get figs for this dish what else can I pair it with? Fresh melon also works well. How about prosciutto wrapped around grissini sticks? Or you could make crostini topped with chorizo and roasted peppers, salami and chopped artichoke, mozarella and coppa. Also you can wrap a the prosciutto around a piece of melon and eat with toothpicks.